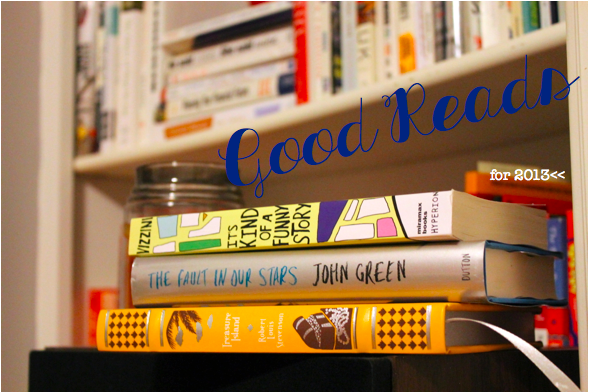 Skinny Jeans & a Chai Latte: Good Reads :: What I'm reading to start the year. I started reading "The Life of Pi" in late 2012 but I can't get through it!! It's been good, but just tiresome at the moment. I wish I could just finish it! I started reading the Infernal Devices series this week actually and I'm loving it! Gah! I lost my last comment I think, so I apologize if I post twice! I'm reading The Round House by Louise Erdrich. So far it's a great book, but more on the depressing side so I'll need to read something funny afterward! I read Glaciers and Water for Elephants in 2013. I'm in a YA Lit class for library school, so I'm reading lots of young books now mixed in with text book chapters. The Fault in Our Stars is so good. So so good. And next on my list is "Room." I've heard many good things, and I'm excited to get it started. My book club just finished "The Twelve Tribes of Hattie," and I also highly recommend that! fault in our stars.... amazing! I've just started We need to talk abotu kevin- that my book club is reading. I'll have to see if my library has any of your reads and give them a look! I'm looking for some new books to read, so I'll give these a go! I've been trying to get back into Meditation for the Love of It. And I have Wild sitting on my bedside table, just waiting its turn. I just finished Warm Bodies and I started Safe Haven. Both movies are coming out next month so I wanted to finish it in time. The Fault In Our Stars and Gone Girl is up next for me. The Fault in our Stars will break your heart, but it's awesome. John Green really gets teenagers in a very human, real way. I just finished Gone Girl, by the way, and HIGHLY recommend it. My dad, on the other hand, wants to read every shakespeare play by the end of 2013. So that's an idea, too.